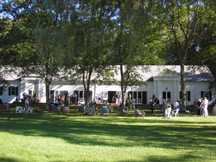 (Falls Village, CT) Music Mountain, America’s Longest Running Chamber Music Festival, delivers another banner weekend of music with first time guest Ariel Quartet with guest artist Soyeon Kate Lee, piano, performing Mozart, Dvorak and Schumann on Sunday, July 23 (3pm). The weekend begins with Anouman making their Music Mountain debut on Saturday, July 22 (6:30pm)! Concerts are scheduled thru September 17. A band of like-minded stalwarts of the New York City gypsy jazz scene, Anouman takes the music of legendary guitarist Django Reinhardt as its jumping off point, but by no means final destination! Consisting of Peter Sparacino (saxophone and woodwinds), Koran Agan (lead guitar), Eduardo Belo (bass), and Josh Kaye (rhythm guitar), Anouman is equipped to realize any spontaneous musical vision and performs their virtuosic and exciting originals to packed houses and foot-stomping, glasses-raised acclaim. Keeping with long-standing tradition, the Saturday Twilight Series features pre-concert dinners at the quaint Falls Village Inn. Experience a piece of history in this 175-year-old Inn before listening to the spontaneous gypsy jazz sounds of Anouman! The distinguished Ariel Quartet with guest artist Soyeon Kate Lee, piano, comes to Gordon Hall on Sunday afternoon to present a classical program including Mozart: String Quartet in G Major, K.387; Dvorak: String Quartet in F Major, Opus 96 “American;” and Schumann: Piano Quintet in E Flat Major, Opus 44. Characterized by its youth, brilliant playing, and soulful interpretations, the Ariel Quartet has quickly earned a glowing international reputation. The Ariel Quartet performs widely in Israel, Europe, and North America, performing with some of the most highly respected artists including pianist Menahem Pressler. The Quartet serves as the Faculty Quartet-in-Residence at the University of Cincinnati’s College-Conservatory of Music, where they direct the rigorous chamber music program and perform their own annual series of concerts in addition to their busy touring schedule. Pianist Soyeon Kate Lee has been lauded by The New York Times and by The Washington Post. She has been rapturously received as guest soloist with orchestras across the US and abroad and often performs in recital. An active chamber musician, Ms. Lee frequently collaborates in many chamber music festivals throughout the United States. She is the co-founder and artistic director of Music by the Glass, a concert series dedicated to bringing together young professionals in New York City. Chamber music concerts continue with Harlem String Quartet with Fei-Fei Dong, Piano (July 30); Aeolus String Quartet with Geoffrey Burleson, Piano (August 6); and St. Petersburg Piano Quartet (August 13 & August 20). The Saturday Evening Twilight Series continues with Alan Ferber Nonet (July 29); Ben Kono Group (August 5); Ryan Keberle & Catharsis (August 12); and Todd Marcus Quintet (August 19). (Falls Village, CT) Music Mountain, America’s Longest Running Chamber Music Festival, delivers another banner weekend of music with first time guest Ariel Quartet with guest artist Soyeon Kate Lee, piano, performing Mozart: String Quartet in G Major, K.387; Dvorak: String Quartet in F Major, Opus 96 “American;” and Schumann: Piano Quintet in E Flat Major, Opus 44 on Sunday, July 23 (3pm). The weekend begins with Anouman making their Music Mountain debut on Saturday, July 22 (6:30pm)! Chamber Music Concerts are $35. Twilight Series Concerts are $30. Children ages 5-18 are admitted FREE for ALL CONCERTS when accompanied by a ticket holder. Visit www.musicmountain.org or call 860-824-7126.